Code 9 Project: Making Mental Health a Priority for all First Responders and their Families. 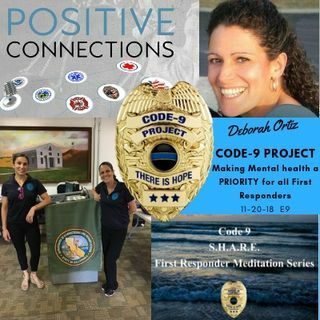 Deborah Ortiz, Co-founder of the Code-9 Project, talks about how this non-profit self-supporting organization began and the amazing services it provides to first responders around the country. Deborah's husband is a 22-year retired police officer who suffered from mental health issues at the end of his career. With the support of family and recovery he was able to turn it around and accept help. Code-9 began with her family's struggles and with the help of others they became a team ... See More dedicated to spread the message that you are not alone and there is a way out.